"Hate the player, love the game...or was that the other way around?" Research biologist Neil Parkinson had to give up a lot in pursuit of his PhD--his friends, his music, his home town--but the one thing he managed to hang on to was Legendary Pairs, the hyper-competitive collectible card game that has propelled so many nerds just like him to fame and fortune. With a new job in a new city, loneliness drives him out of his apartment and into The Ogre's Den--a haven for local players, amateur and pro alike. Neil never aspired to be a professional gamer, but that was before he met Robin. "Why even play, if you don't play to win?" Robin Abboud is cocky, brash, argumentative...and absolutely gorgeous. He may be a lowly caterer with a crappy car, but this game is the one place where he's a top dog, and boy does he know it. Robin's end-game goal is to play in the Legendary Pairs Pro Tour; he's got the skill to do it, and from the moment he meets Neil, he's convinced Neil does too. His flirty bravado gets under Neil's skin like nothing else, but he runs so hot-and-cold that Neil can't figure out if the two of them are competitors, friends...or something more. "Don't tell me this is just a game to you. I know better." When Robin convinces Neil to join him on a road trip to a major tournament, there's more on the line than just the cash prize. Even as the two of them clash on the field of the tournament, Neil's feelings for Robin are growing impossible to ignore. But could Robin ever feel the same way? The longer they spend together, the more Neil risks showing his whole hand. Is a perfect match in the cards for these two, or will their in-game rivalry tear them apart? 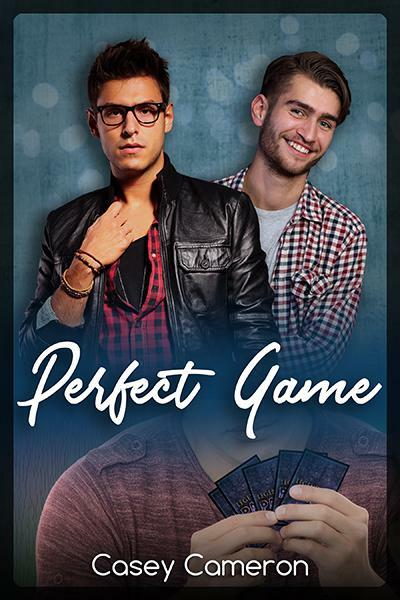 Perfect Game is a 25,000 word stand-alone romance novella with lots of heat, deliciously nerdy sweetness, and a happily-ever-after ending with no cliffhangers.